Teota had been fighting for so long. They knew nothing but pain and suffering at the hands of whatever foul disease currently resided in their body. They knew that they should have listened and never entered the cursed swamp of Uirji. The call was too strong, and could not be resisted. Teota told no one that they had went into the swamp because it felt like the right thing to do. They awoke the next day to the terrifying realization that they should have never left the swamp. Teota stepped from their home and found that many days had passed since they had laid down in their bed. While many days had passed this paled in comparison to the number of people that had passed in that time. There were none left alive, and the sickly sweet of death and disease hung thick in the air. Teota heard a moan off to their right and they labored their way to where the noise had come from to find their aunt Nolinal drawing in shallow, labored breathes. Nolinal begins to mutter something too quietly for Teota to hear. With slow, but determined steps Teota makes their way back to the swamp of Uirji. They continue directly to the heart of the area, and are not impeded by any of the flora or fauna. “Uirji! Why have you done this! ?” A voice enters their mind, “So you would know the power I can give, and the futility of resisting it.” In wave of grief and true acceptance Teota falls into the swamp knowing that the disease they carry will never kill them, or leave them. With those bits of more out of the way it’s on to the album! For this one I am taking a look at Deliver Us the fifth studio album from the melodic death metal band Darkest Hour. I listen to all of the albums that are used as inspiration here, and this is certainly the one I have enjoyed the most while listening. I knew I wanted to make a feat, and the cover itself drew me into the idea of someone fully accepting a sickness that they stumbled into. 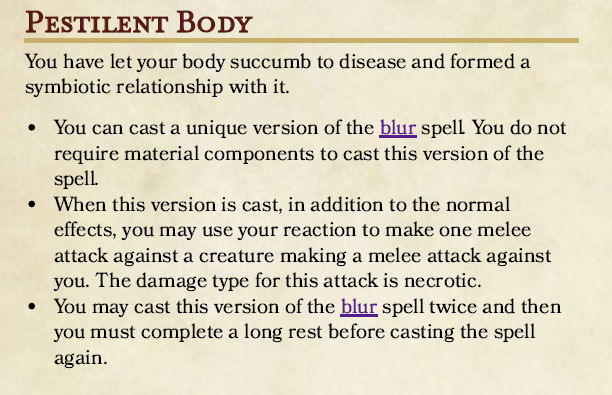 Without any more typing I give you the Pestilent Body feat!